Studying Medicine in Pakistan A grant from the Endeavor Foundation allowed Midha Ahmad '21 and Sawera Khan '21 to spend the summer in Pakistan, where they compared alternative medicine to traditional treatment. 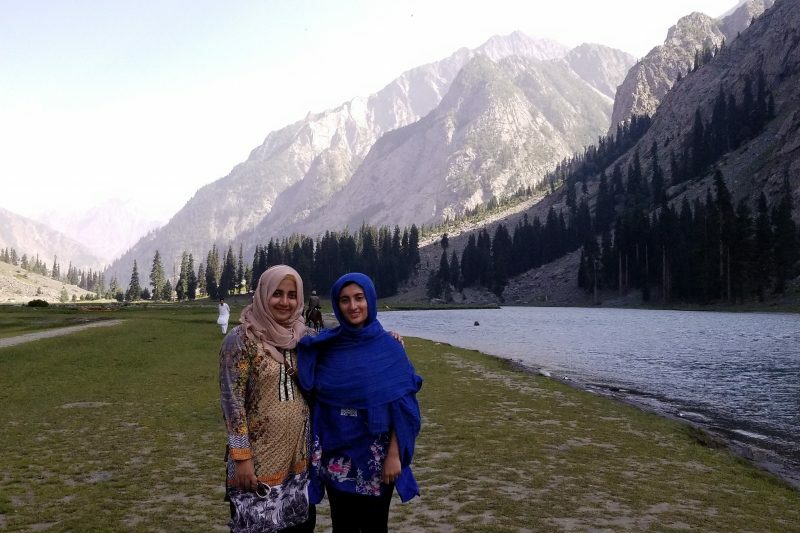 Midha Ahmad and Sawera Khan, both Class of 2021, in Pakistan during summer 2018. Midha Ahmad ’21 and Sawera Khan ’21 were one of several pairs of Washington and Lee University students who were awarded Endeavor Foundation grants for summer 2018. These grants allow students to pair up and pursue summer research projects overseas. Student teams for Endeavor projects are traditionally made up of one American student and one international student; the teams then spend time doing research and sightseeing in the international student’s home country. Midha, a native of Islamabad, Pakistan, is majoring in neuroscience with a minor in either creative writing or Middle East and South Asia Studies (MESA). Sawera, who hails from Atlantic City, New Jersey, is majoring in biochemistry with minors in MESA and human poverty and capability studies. Please briefly describe your project. Why did you choose this topic? Midha: Sawera and I centered our research around alternative medical practices in Pakistan — that is, any medical practice that cannot be categorized under the conventional, allopathic practice that is common. Most of these practices aim at using characteristically prepared medicine from herbal resources to treat a variety of ailments of patients. These practices are extremely popular in Pakistan for many reasons; they are reasonably cheaper, more easily accessible and are much preferred than their allopathic counterparts as they can be consumed without any side effects. They also constitute a big part of traditional Pakistani life. We chose to conduct our research on this topic as we were curious about how much these traditional medical practices have integrated themselves within normal Pakistani life, and how well they have aligned with the modern medical field during this era of technological boom. Sawera: Although I currently live in the states, I was born in Pakistan and most of my extended family lives there. One of the things that I remember most from my time there and from talking to my family is how much people rely on non-allopathic medicine. This includes herbal medicine (hikmat), homeopathic medicine and religious scholars (aalima/hafiza). Midha and I wanted to see why these types of medicine were so popular in Pakistan and how/whether poverty, lack of access to healthcare or religious beliefs played a role in its widespread use. 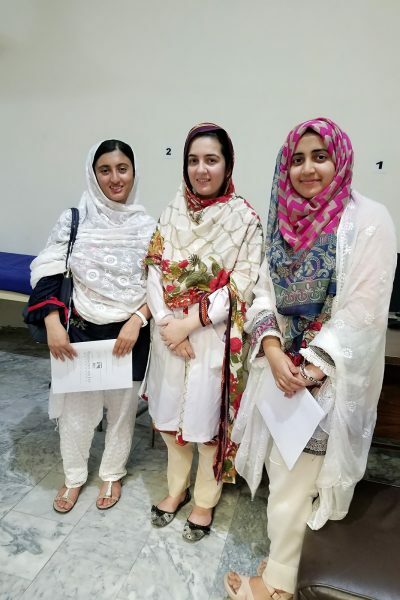 Sawera Khan ’21 (left) and Midha Ahmad ’21 (right) pose with Dr. Mehwish Khan, a general practitioner at DHQ Hospital Charsadda and one of their first interview subjects. Midha: We traveled a lot — probably halfway across Pakistan— to hit the big cities as well as the rural areas. Our goal was to widen the scope of our research to get information from people across many different medical fields. We interviewed the practitioners of alternative medical practices themselves — hakeems, homeopaths, ayurvedics, religious scholars, etc. — as well as some of their clients. We also interviewed allopathic doctors on the opposing side to get their point of view as well. Our focus mainly was on how their practices were conducted, the degree of effectiveness of their services offered, the type of clientele they receive, the type of acute and chronic illnesses they treat, and so on. Sawera: Before we actually went to Pakistan, Midha and I contacted practitioners from each of the different medical practices we were going to explore and asked if they would be interested in doing an interview with us for our research. A lot of the people we asked were very interested and agreed to be interviewed. We traveled across most of Pakistan, from the north in Kalam, Madyan and Bahrain to as far south as Lahore. We covered well over half of Pakistan. One of our main questions in doing this research was whether these practices were popular in both rural and urban areas. By exploring such a large part of the country, we were able to hear from both the rich and the poor, males and females, doctors and clients, and hear many different opinions on traditional medicine. While most people were eager to sit down for an interview, others were much more hesitant. In fact, none of our interviewees consented to a video interview, and only some to an audio interview because of the very conservative culture of the country. Despite this, we were still able to get plenty of information on how these practitioners conducted their treatment, which maladies they treated, who they treated and their thoughts on why they believed traditional medicine was such a big part of Pakistani culture. What were your most important takeaways from the research? Midha: We received a lot of information, but to break down our findings, these practices remain a huge part of Pakistani life and will continue to do so. Most of the clientele that visit these practices are those who have had an acquaintance who benefited from them before. In the big cities, in most cases these practices are seen as a last resort option to consider if you are in the final stage of an illness and have given up on modern medicine. Conversely, clients regularly visit these practices in less affluent areas of Pakistan, in place of normal doctor consultations. Perhaps the most intriguing finding was the claim from both practitioners and clients to have treated “incurable diseases,” like many types of cancer. Tension and friction exists between the alternative and allopathic fields, both accusing the other of selling adulterated medicine to clients and doing irreversible harm. But both fields do acknowledge the benefits the other field brings to the medical world and hope that peaceful co-existence under government supervision would be possible soon. Laws have been made for the latter with varying results, due to the current unstable political climate of Pakistan. We do hope to present these findings through presentations and media, and hopefully contribute to some papers. Sawera: One of the biggest factors in these forms of medicine is faith/belief. One of the examples that I remember most distinctly and one that many of our interviewees gave was that of Surah-e-Rahman, a chapter from the Qur’an, being played in Cardiac ICUs. According to our interviewees, patients in hospitals that played the recitation saw better results than those in hospital that didn’t. People in Pakistan genuinely believe that traditional treatments will cure them because they have such strong belief in hikmat and the Qur’an. Another big takeaway was that, unlike what most of the allopathic doctors believed, not all of these traditional medical practitioners are just in it for the money. We heard of one family who made an herbal concoction that was used to pass kidney stones. Patients found out through word of mouth and went to the family. 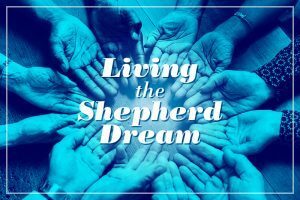 The family said that they did not want any money because they were happy to share their gift from God and perform a good deed. The biggest takeaway was that these practices are used by the rich and the poor and those that live in urban and rural areas equally. While money is definitely a factor in medical treatment in Pakistan, both the rich and the poor turn to hikmat and aalima/hafiza when they have exhausted all other treatments or in addition to going to an allopathic doctor. Midha, what was it like introducing your study partner to your homeland? When you saw it through her eyes, what was different about it for you? With Sawera, I got to revisit a lot of my favorite childhood sites and a whole load of new ones. It was nostalgic yet exhilarating to see everything again from new eyes. I guess I never realized how rich in culture every single site was, how much history was contained within the walls, and how valuable that is — something I subconsciously knew but never paid attention to. For me, mundane things of everyday life gained a new meaning. Sawera, what were your impressions of Pakistan after this visit? The last time I was visited Pakistan was in 2012, almost 6.5 years ago. Since I had been to Pakistan before, I was expecting to be very familiar with the culture and the environment. However, I was definitely not ready for the super-hot summer weather (average 105 degrees), or the lack of 24/7 electricity, or the mosquitoes! Even though there were power generators and solar panels, sometimes everything just stopped working and I would find myself sleeping in mosquito net, in 100-degree weather with no fan, let alone an A/C. On the other hand, there were so many places that I was able to see because of this experience. Because I have lived in the states for most of my life, my parents, my family in Pakistan, and the media always painted an image of a third-world, war-ridden, impoverished country. While it is true that Pakistan is still a developing country, this trip helped me see how beautiful my birthplace was. 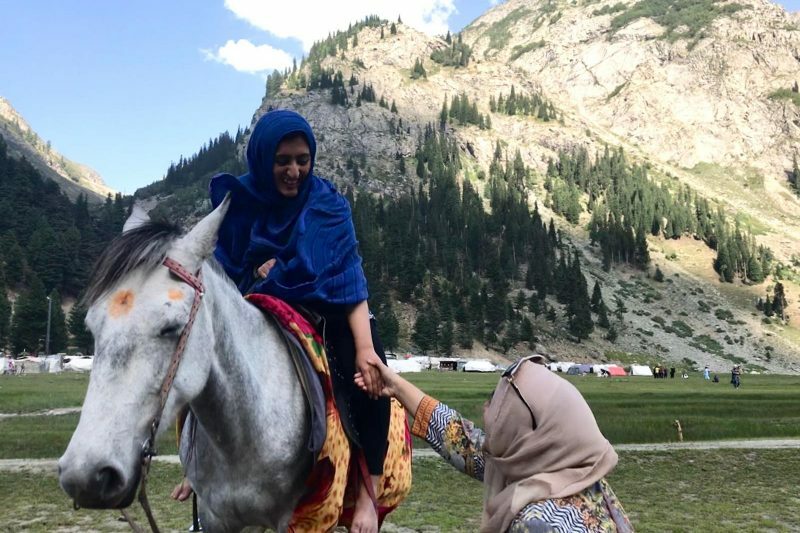 I was able to connect to my roots, meet some of the most hospitable people I had ever met, listen to beautiful music, and see stunning scenery that I would never have imagined being in Pakistan. Making an equine friend at Lake Mahodand in Swat Valley, one of the sites they visited for the cultural immersion portion of the trip. Midha: I would definitely say it would be the stories and anecdotes we heard. Stories of patients with debilitating illnesses, of fighting through the worst and pulling through with sometimes only hope and faith, when everything else fails. Of miracles being performed and of dreams being fought for. Perhaps the most heartwarming stories were of those offering medical services free of cost to those who cannot afford them, which was more common than not. Kindness, I realized, was sometimes more healing than medicine could ever be. Besides that, it would be the hospitality of the people we met. Our topic was a bit sensitive, but the people were very accommodating. We couldn’t leave the establishments without drinks and refreshments being offered by strangers! It was definitely a blessing in the heat of 115 degrees. Sawera: My favorite part was seeing the cultural differences in the different cities that we visited, from Kalam to Charsadda to Islamabad to Lahore, and listening to the stories of the people of these different regions. It was very interesting to see how, between the Pashto and Urdu speaking regions, despite the difference, there were also many similarities in the experiences that people had with traditional medicine. Another part that was really enriching for me was that we were using three different languages, English, Urdu and Pashto, when conducting interviews. It was remarkable just seeing the variety of cultures, traditions and languages of Pakistan despite the fact that over 90 percent of the country shares the same religion. I also just loved all of the cultural heritage sites that we visit because it made me see how beautiful Pakistan is. Midha: My major is concerned with the medical field, so it was definitely like gaining hands-on experience within the real world. Reading about something in class is way different than actually interviewing doctors, medical experts and clients about them. It was fascinating to place my limited knowledge within the vast medical field, and to see the myriad of ways it has been incorporated and carried out. To be brief, this trip was definitely an experience of a lifetime, and is something I’m not going to forget anytime soon. Sawera: I am a biochemistry major on a pre-med track, with a double minor in poverty and human capability studies and Middle East and South Asia studies. Through this trip, I was able to bring all three of my areas of learning together into one moving experience. Not only was I able to explore different types of medicine, which I will most likely not learn about here or in medical school, I was also able to experience the culture of Pakistan and its people. I was so satisfied with my progress these past two months that I want to go back for another summer and do more research, a Shepherd internship, or even incorporate all of this into my poverty and human capabilities capstone. I am so grateful to the Center for International Education for giving me the opportunity to explore such a beautiful country and allowing me to explore and learn more about a topic that I am very interested in. Thank you for allowing me to explore my passions and helping me figure out what I want to do with my education at W&L.